As most of you know, I believe very strongly in using quality ammunition when hunting big game. Bullets kill by destroying critical tissue and a good bullet is designed to get to those vitals under whatever shooting conditions might exist. I am a fan of the Barnes TSX bullet because I have seen it work on really tough critters, like cape buffalo, Asian buffalo, and Australian wild ox. Another bullet and cartridge that is quickly becoming a favorite is the Trophy Bonded Tip bullet as loaded by the Federal Cartridge Company. I am shooting the 165 grain Trophy Bonded Tip ammo in my Ruger .30/06. Nominal muzzle velocity is 2800fps, with a muzzle energy of just shy of 2900 ft lbs, and the accuracy is quite good. The jacket is bonded to the bullet core for a very high weight retention. And the bullet also features a polymer tip and boat-tail design for flat trajectory and improved accuracy. The bullet shown above on the left was recovered from a West Texas mule deer. The two on the right were recovered from two different aoudad. Distances involved in the shots ran from 50 yards to 150 yards. 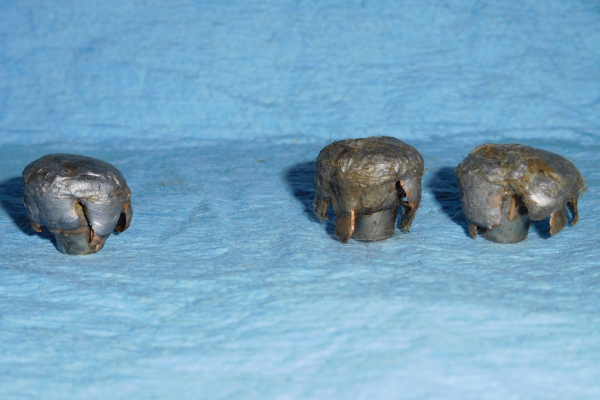 As you can see, the bullets didn’t go to pieces and retained nearly all of their weight. All three animals were stopped in their tracks. It is my belief that most inexperienced hunters spend too much time studying and arguing calibers when they really ought to be studying and trying to understand bullets. The more a fellow understands the role that hunting bullets play, the more he will appreciate good quality, premium hunting bullets, like these loaded by Federal. This entry was posted in Ammunition, Hunting, Rifles and tagged aoudad, barnes bullets, federal. Bookmark the permalink. action looks annd they’ll work well with Minecraft mods. Alll your belongings is going to be awaiting you for the limited timeframe, however they wait where you died.